Fabrication can be everything from the simple gusset reinforcement to a turnkey project from design stage to finished product. 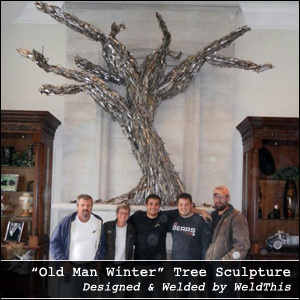 Bring your idea, vision, or drawing to WeldThis and we will make it a reality. If you already have your idea, please give us the opportunity to price it and offer suggestions. We love a challenge, and our specialty is making what does not already exist. The difficult we do immediately, the impossible takes a little longer, and miracles are by appointment only.